This weekend I acquired a virus that has had me down for a couple of days. Since I'm still feeling puny, I thought it would be a good time to repost a series on Advent. Now is the time to start thinking about how you want to spend Christmas 2010. I really don't need to say it. We all know that Christmas has gotten WAY out of hand. The marketing campaign is launched long before November even arrives with store displays, flyers, and pre-holiday sales. And if you can wait until the day after Thanksgiving, you can even shop one of the busiest days of the year! Oh, joy. So if we all know it, why do we keep doing it? Why do we stay on the band wagon of consumerism when it is suppose to be a season of worshiping, remembering, and celebrating? What is it that we are afraid of? Truthfully, in ten years our kids will remember making cookies all afternoon and getting to use all the sprinkles they wanted more than what they unwrapped on Christmas Day in 2009. Sure there is the exception. That one, long desired and sought after item such as a Red Ryder carbine-action, 200-shot, range model air rifle. It isn't the number of gifts or the cost of the gift that tugs at a child's heart. It's the imagination! What one can be or become if he has that special toy that has been elusive for so long. But overall, they won't remember most of the stuff. They'll remember the love. The togetherness. The laughter. The goofy. The serious. The magic of lights. It's up to us to break the cycle of consumerism and establish new territory. Scary, I know. But somebody's got to do it. Why not be a pioneer? A Christmas pioneer! Forge new territory. Take a risk. Set out on a new path. Face the challenge. Make the decision today that in at least one way, you will make this Christmas different than the last by stopping the consumerism. (And let me make it clear, that while I'm a capitalist, Christmas is about worship). 1. Get your spouse on board. Share your heart and be willing to compromise. It might not come as passionately to all the members of your family, especially if you have a spouse who is like a grown up kid at Christmas! Don't get frustrated, just ask that the family consider making one change this Christmas and see how everyone likes it. • What is the most important thing that you want your family to do to in order to truly celebrate Christ's birth? What is hindering you from celebrating? • What puts a damper on the season? • What truly gives you satisfaction at Christmas time? • When do you feel you've worshiped the most during past Christmases? • What traditions meant the most to you as a child? • What current activities do you have that your children will call traditions? • Are these the traditions you want for your family? • What is missing that you feel needs to be included? • What do you wish you could eliminate this year if you knew it wouldn't hurt anyone's feelings? • If there is a family obligation that cannot be eliminated, how can you interject something into the situation that would make it better for everyone? 3. Pray. Based on your evaluation, you will start to camp out on something that you know in your heart needs to be changed. It might be the most difficult thing on your list, but it's bugging you the most. Ask God if this is the thing that you need to change this year. 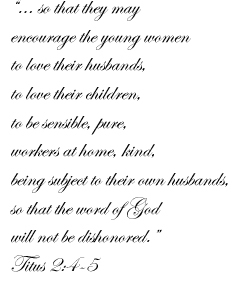 And if it's not this, then ask Him to show you what He would have you do. 4. Form a plan. After you've spent some time in prayer, start planning how you will implement your new priority. This, too, will require prayer! Most likely, something will need to be eliminated in order to add something in. How will you handle that? How will you notify family? How can you make it sound as positive as it really is? Think this through carefully. 5. Schedule it if necessary. Put it on the calendar. If it's baking cookies, set aside a day to gather supplies and another day to do the activity. If it's building an outdoor nativity together, block off a weekend. 6. Contact those it affects. Family pow-wow. A phone call. Email. Whatever it is, don't wait until too late or you might have hard feelings. People need time to adjust to new things. This doesn't mean they are rejecting your idea, they just need time to get use to it. If it involves less gifts, it is courteous to notify family in advance, before purchases are made. And if it requires a change in family plans, this is a must! 7. Re-evaluate after Christmas. This is highly important! Who loved it and who didn't? Why? Was it just 'new' and needs to be tried again next year? What would you like to add next year? 8. Write it down. I keep a Christmas notebook so that I will remember things from year to year. While you may remember the wonderful time you had, you may forget the details that made it so successful. Be sure to include notes for changes next year. 9. Follow up and thank family. Be sure to express your gratitude for those who had to be flexible. Let them know how your family was blessed by the changes and find out if they were pleased as well. 10. Begin thinking of next year. Be in prayer and open to the Holy Spirit for how you can continue to make changes each year. Your family will grow and change and your activities each year will need to adjust as well. As children grow and get married, their spouses will come with traditions of their own. Working in a spirit of love and developing communication now will lay a foundation for working with new members in years to come. If you haven't figured out by now, a worshipful and meaningful Christmas is one of my passions. I'm hoping to release my first eBook entitled A Simple Christmas sometime in the next month. I'd appreciate your prayers as I tackle this project. And be sure to share some of your stories of changes you've made in the comments section. We all need encouragement to do this thing! I know... it's only August. But some of you have already started thinking about Christmas. And before we get any closer to the season of giving, I'd like to encourage you to enter it with a different mindset this year. Visit Advent Conspiracy's website and find out more about this radical approach to the holidays! Be purposeful. Be radical. Be a pioneer. That the King of glory may come in! He is the King of glory. Selah." with My Father on His throne." Open wide the doors of your heart for Jesus! Celebrate and offer Him the praise He is due. The King is awaits! Since I have a rash all over my right hand (yes, I'm right handed), typing is a bit painful right now. But I love photos! Do you? And can you ever have too many of the chickens? I think not. Some of these are older, but fun just the same. Can you tell which child is my "chicken gal"? If only I had photos of all the times she wagged one around the yard! My favorite is only in my mind's eye. The sun was just coming up and I heard her outside with the chickens... dressed in a bright yellow and red silk night gown, with a bold striped sweater, red rubber boots, and a chicken under her arm walking around the yard talking to it. Priceless! Since I went on my redecorating spree at home, I did quite a bit of polishing on my wood furniture. 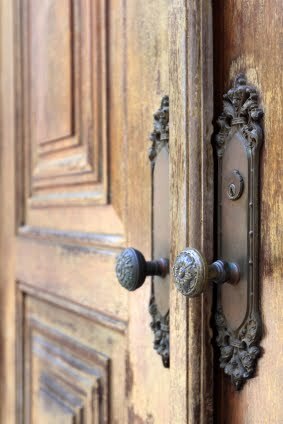 It reminded me that I want to try a natural wood polish. I'm posting a few recipes for anyone who is brave enough to try them. I'd love to hear your comments on what you like and don't like about each. I'll be experimenting, too, and I'll add an update just as soon as I have results. Pour ingredients into a spray bottle for easy application. Just spray and wipe with a soft cloth. Apparently you can add essential oil to make this fragrant if you wish. This recipe would be best if your wood needs heavy moisturizing, something that might be necessary in the dry west, but apply sparingly. 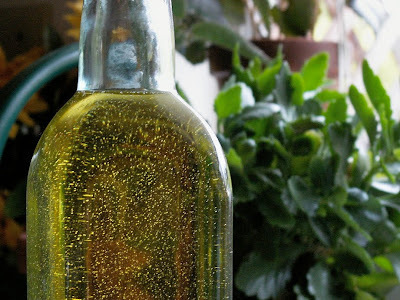 If the olive oil goes rancid and it gets warm, you might notice a smell. Follow same instructions as above. Again, utilize a spray bottle and add essential oil if desired (lemon would be nice). 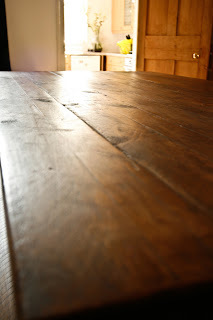 This recipe would be appropriate for wood that has accumulated excess wax and needs to be revived, but it would also be the best recipe for weekly maintenance. Apply with soft cloth in small amounts, rubbing in wide strokes to spread polish evenly. • Jojoba oil can be substituted for each recipe. It remains stable the longest and works well, but is harder to find. • Flannel is ideal for polishing furniture. 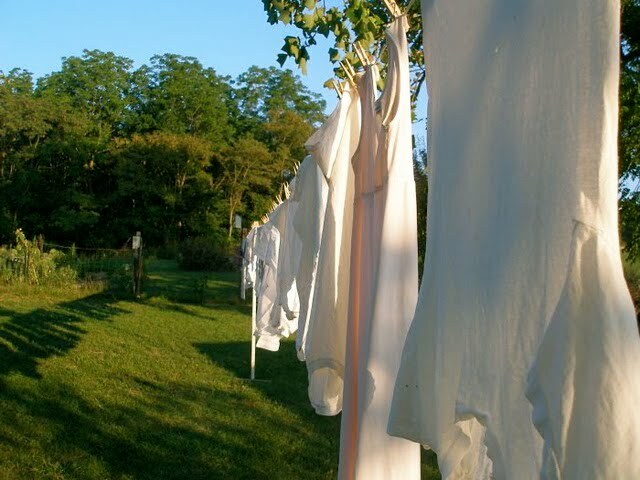 Save those old flannel sheets or work shirts of your husband's and cut them up for polishing rags. • Apparently, most beeswax recipes include turpentine or linseed oil, something I would not recommend. 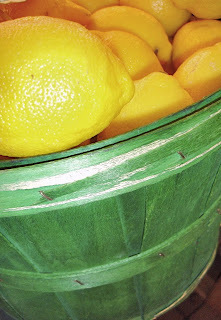 Do you use a natural homemade furniture polish? If so, feel free to share your recipe in the comments section! 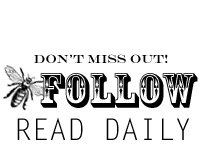 Yes, this is a homesteading blog. But my homestead includes a house. Actually, a home. Does yours? I could spend so much time out in the yard that the house never gets a thought, until winter, when I have to be indoors most of the day. I guess I'm apologizing for writing a post on decorating, but homesteading isn't just about the animals and garden. I want my girls to know that keeping a lovely home is as important as keeping a lovely chicken coop! ... and loved all the white, wire, and chickens, as well as the light and airy look. (I don't get out much!) Hmmm... my living room needed a redo. But in keeping with my budget, I walked out with zero items; only a couple of photos I took with permission. The next day at home, I uploaded the picture and started looking at it again. Could I pull something like it off with what I had? What was it that REALLY appealed to me in the photo? Did they have an item that was essential to this look or was it just good planning? I started tackling my living room. Here is a corner of the room before. This piece of furniture sits just to the right of the wood stove area. I had really liked this before it got too cluttered looking. Things just kept making their way to the area, like the red jar and another photo or two. It had become way too heavy to really appeal to me. 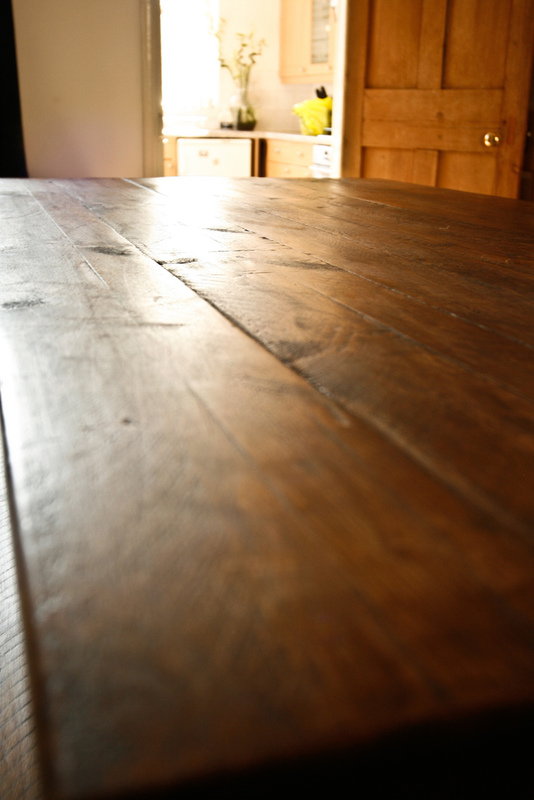 To remedy the situation, I started by removing everything and giving the table a good polishing. Then I put back only the elements that I thought might give me the look I wanted. The inspiration photo had a large vase. I loved that white vase, but I had a perfectly lovely one already. It made no sense to buy another. And once again, I had to remind myself that the overall look is probably what was really appealing to me, not just a single item. I had some silk olive branches in the storage room upstairs - a quick switch and it looked like I had a whole new vase! I repurposed the apple branches outside by the front door in an old milk can. 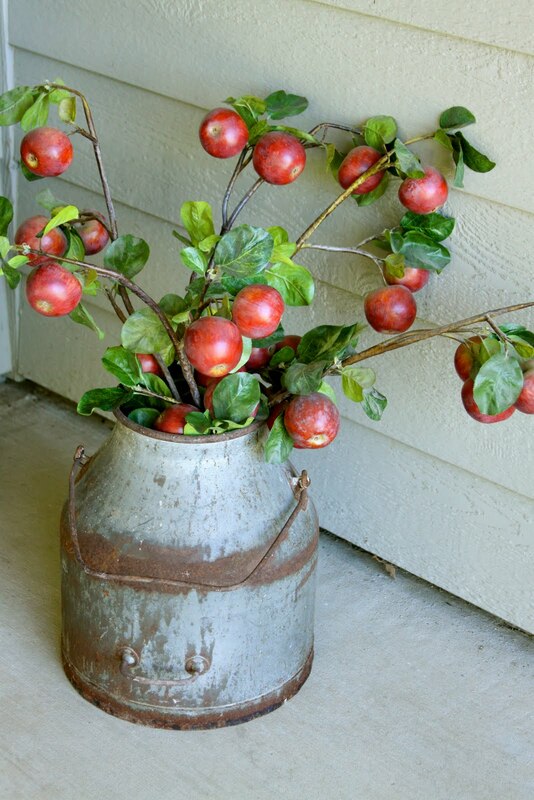 Perfect for our fall apple season. Back inside, I left the large tin ceiling tile that I adore. The texture and color speak to me every time I see it. So that stayed as well as the candle sticks. Next I needed something of a different texture to replicate the look of the wire chicken tray. This was a tough one. I didn't have a wire chicken tray. However, I did have another kind of wire tray that I was wild about years ago when I bought it, but I had never found a use for it that I was happy with. Until now. Finally, I needed something white and a chicken item. I had plates with chickens, but I wanted to use them elsewhere, which you'll see in a minute. So I added a ceramic chicken in white that had been on my mantle. it was part of a pair and I decided that I really didn't have to keep the two together. Sorry Mr. and Mrs. Chicken. So, what do you think of the free makeover of my table? While it certainly wasn't the same as the inspiration photo, I think I at least captured some of what appealed to me about the display at Pottery Barn. I liked this, but perhaps several years of looking at it left me in need of a change. Very symmetrical, wouldn't you say? I changed it up a bit based on the top photo using items I had in cabinets; things I loved but didn't ever have out because I didn't have a place for them. I even pulled out some favorite napkin rings with numbers and some napkins for color. I love these items, but almost never get to enjoy them because I don't use them for every day. Perhaps it's not as exciting to everyone else, but for me it was fresh and new. Like getting a makeover for free! • Pull out some of your favorite items and keep moving them around until it makes you happy. • Take cues from photos in favorite magazines, catalogs, and internet sites. • Mix textures and patterns. For example, don't put only ceramic items together. • Break up sets. I didn't keep all the chickens, plates, or glasses together. Notice how things are scattered. • Decide on a color scheme with at least three prominent colors (mine was white, yellow, and green), but add a dash of the unexpected (I added a touch of red, brown, and blue). • Mix old and new. • Vary the height of items. • Stand items on their side or end and prop them up. It makes a tray or other item look totally different. • Less is more! Don't over do it. It's okay to have some space! Besides being free, the good thing about this is I can always put it back the way it was. And in a few months, I just might do that. But for now, it's nice to have a change. Jayme at Tales From the Coop Keeper, just redid her office using the same concept of moving items around and using what you love. But she's much more entertaining than I am, so you should really read her post from yesterday. At the end of her post, she mentioned the old adage,"Use it up, wear it out, make it do, or do without". I think we need to encourage each other in this, because if you're like me, I can get really tempted to buy "just one more thing". I'm afraid things are going to be tight for a long time, but that doesn't mean our houses have to feel like they went through a depression, too. When we take the time and make an effort to bring beauty and order into each room, the whole family benefits. It draws them in and gives them a haven of rest from the world. It's soothing to the soul. It's home. Any tips you'd like to share? If so, leave a comment. 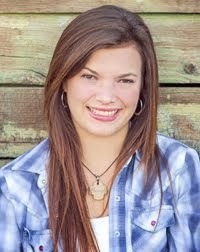 Want to share a photo of your own makeover? Come on over to the Community Forum! 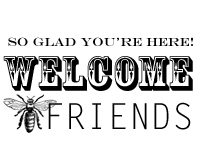 There are so many wonderful bloggers and homesteaders out there, I thought it would be fun to get to know some of them better. 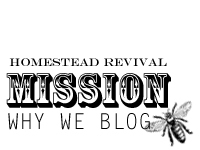 Each month, I hope to feature a different homesteader and interview them with all sorts of fun questions; things I'd like to know about them! And then, you can perhaps ask some questions in the comments, too! I'm excited to be starting with Thy Hand Hath Provided. She's so gracious and humble about everything she does. And trust me, she does a lot of stuff really well! Like cooking. 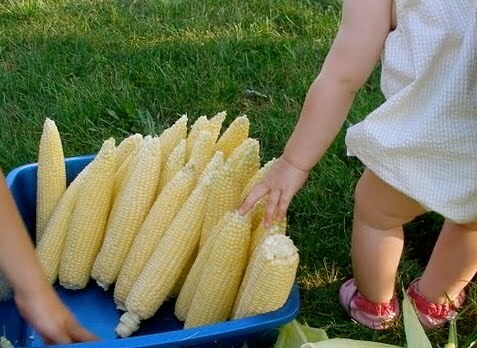 Her family eats well, she grows a ton of her own, and the food looks fabulous! 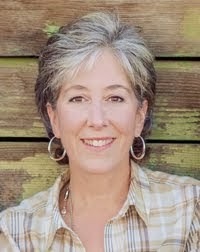 You'll find her blog has an extensive listing of great recipes. And did I mention she cans in bulk? Serious stuff here. She feeds her family for the entire year! I don't think she calls herself a prepper or even uses that term, but she would put some of us who call ourselves such, to shame! Then there is the gardening. Because she's so thrifty, she grows almost everything she puts up. And I love her chickens - don't I always! You can never have too many sweet hens. 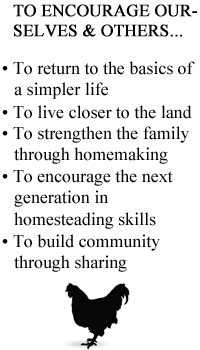 Why do you actually practice homesteading? It means a lot to us to be able to grown much of our own food so it doesn't have to be trucked (or flown) in from other parts of the world. Homesteading takes a lot of work and attention, but we would prefer to all be together, doing meaningful work instead of being off in different directions participating in less fulfilling activities. We like being able to watch first hand as God's creation responds to care and in turn provides for us. We want our children to understand where food (including meat) comes from and the effort and care it takes to bring it about. All this leads to a greater appreciation for what we have- a value that we want to instill in our children amidst a society which doesn't always seem to appreciate what it has. Growing much of our food and living frugally frees up extra income for giving to those in need. It also makes returning to school full time more feasible (Jamey is currently in his fourth of five years of pharmacy school and I stay at home and homeschool our three children ages 7, 4, and 1). How long have you been homesteading? Almost 6 years ago, we moved from a development to the country so our kids would have more room to run and play and so we could start a little garden. Over time, we kept adding and improving our property of 1.6 acres. We've found that this is more than enough space for us to do everything we want to do right now. 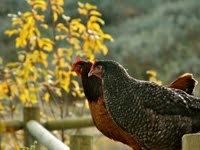 As we gained experience and confidence, we increased our garden sizes, made use of outbuildings we originally thought we'd tear down, acquired chickens for eggs and meat, planted fruit trees and made other improvements. It's just been a natural progression for us that occurred over time, not something we just decided one day to do. Was this something you grew up doing, or did you have to teach yourself? Since both Jamey and I were raised (and remain) Mennonite (to learn more about our faith, you can read an interview I did on Clover Lane- the link is found in the “Who I Am” page at the top of our blog), that doesn't mean we knew the ins and outs of farming/homesteading. Jamey and I both grew up with gardens, but neither of us enjoyed helping with them much. Animals were pets. We had to learn a lot on our own because we failed to care or pay attention when we were growing up. It has helped having parents to go to for gardening advice, but much of what we've done, we read about and learned about our own. What resources have you found helpful for learning new homesteading skills? Friends and family have provided us with helpful recommendations on gardening and chickening. The internet is an absolutely amazing resource. Particularly websites like Mother Earth News offer reliable, respected advice on all things relating to homesteading. Even youtube came in handy when we wanted to learn how to skin chickens (to avoid having to pluck them and since we don't enjoy eating the skin anyway). 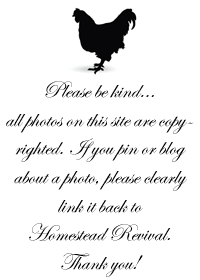 Other homesteading blogs have also been helpful. 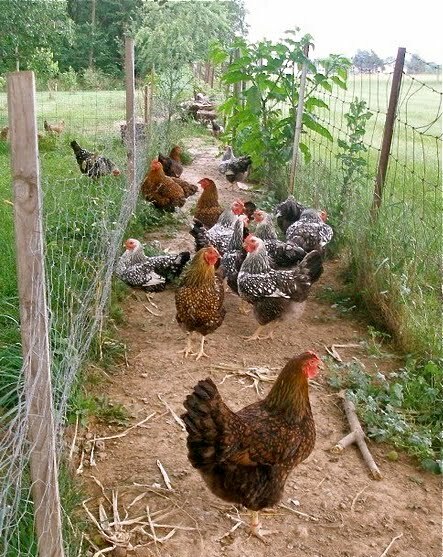 Do you raise any animals or garden on your homestead? We currently have one cat and about 35 chickens, 11 of which will soon be harvested and stored in our freezer. We have two large vegetable gardens, four peach trees, six young apple trees, a pear tree and a sour cherry tree, red raspberry bushes and a sunflower patch (my brother's grew and sold sunflowers this summer). Tell us about how a typical day looks? Our days look very different depending on the season. Other than egg collection and feeding and watering the chickens, there are very few “homestead” chores during the winter. Spring involves a lot of garden prep, starting plants indoors, and planting. Summer is full (to the gills!) 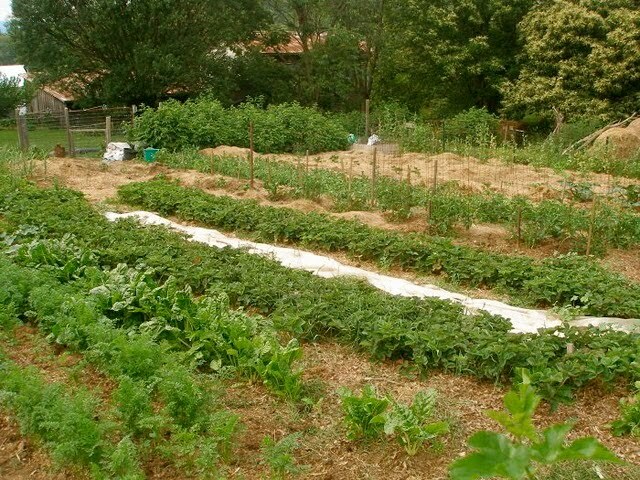 of weeding, watering (from rainwater collection tanks) harvesting, canning and freezing. Fall includes more harvesting and storing of vegetables. The changing seasons are such a blessing. I am VERY ready to move on to the next one as the current season comes to a close. It's the variety of life- our Creator knew we would appreciate it. 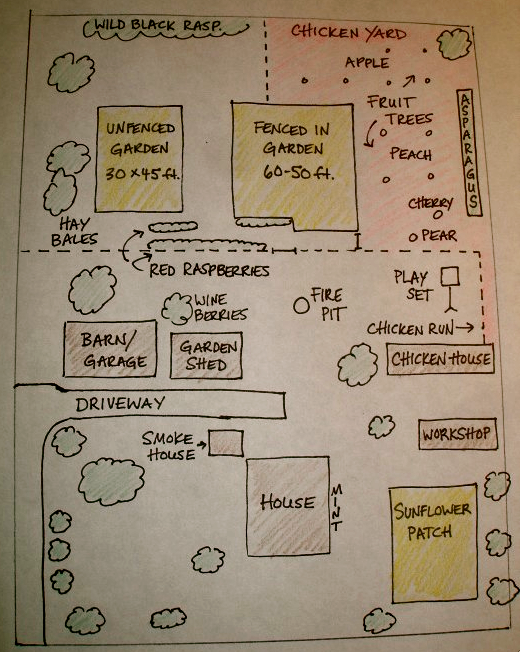 What is your favorite part of homesteading (or benefit)? There are many! I love watching our chickens roam around in their yard, eating plants and bugs. I love looking at a full pantry at the end of the summer after hours of work and know that my winter meals will practically take care of themselves. I love walking around the property as the sun sets- it makes even the weeds look lovely. I love watching Sam chase chickens back into their yard, Sadie eat tomatoes out of hand and Miriam toddle around after our cat. I love knowing that we are leaving less of an impact on the earth and that our children are experiencing God's miraculous creation and the way it takes care of us. Do you have plans to expand your homestead in any way? If we have an opportunity to acquire more land in the future, we have talked of raising sheep and/or highland cattle. We have also talked of adding turkeys to the mix since we already have a great place for them (minus some fencing). What new skills are you hoping to acquire in the future? As our children become more independent and some time is freed up, I look forward to trying my hand at cheese making (I've only dabbled so far) and grinding our own wheat. 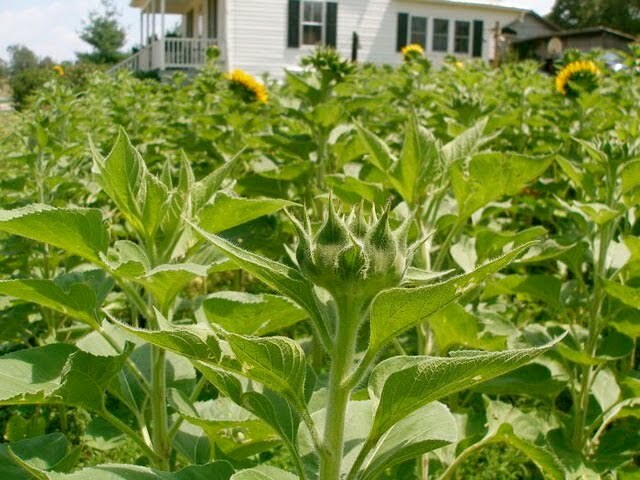 We're also considering other ways to use up more lawn space (the sunflower patch gave us a wonderful taste of this) to utilize space and decrease the need for mowing. Overall, I am very satisfied with what we are doing now. 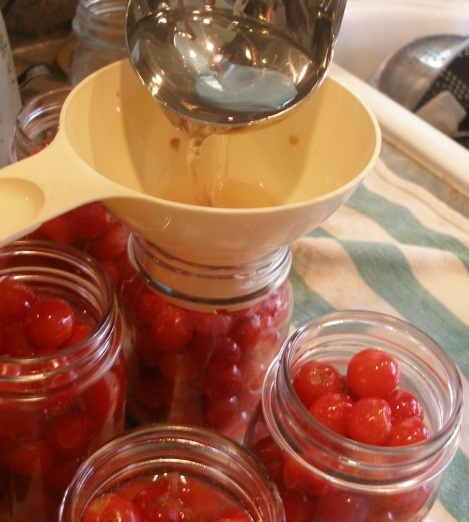 You’re quite accomplished at storing food, whether in the freezer or by canning. What advice would you give to someone who wanted to start doing this on such a large scale? Start slow and small. This has worked very well for us. Each year, we've increased garden size and amounts preserved based on our confidence levels. Jumping in too fast and taking on too much would have left me stressed and overwhelmed. Keep doing what works well, try a couple new things each year and when you've mastered them (to your satisfaction), move on to the next couple things you'd like to try. Putting that much food up each summer requires a lot of work! How do you pace yourself so that you can get it all done? I wish I could pace myself! Unfortunately, the garden and local orchards don't coordinate their schedules based on how busy I am:-). Recently, I had about three straight weeks where I had at least one canning/freezing project per day. It's tiring work and I've been know to break down and become quite irrational (tears and everything!) this time of year. I ask myself WHY in the world I am doing all this. Thankfully, it's a fleeting thought and after a good night's sleep and the jars are on their shelves, I tackle the next project. The benefits far outweigh the drawbacks for us. Tell us about your wonderful recipes on your blog so that readers can find them when they visit and what inspires you when you cook? 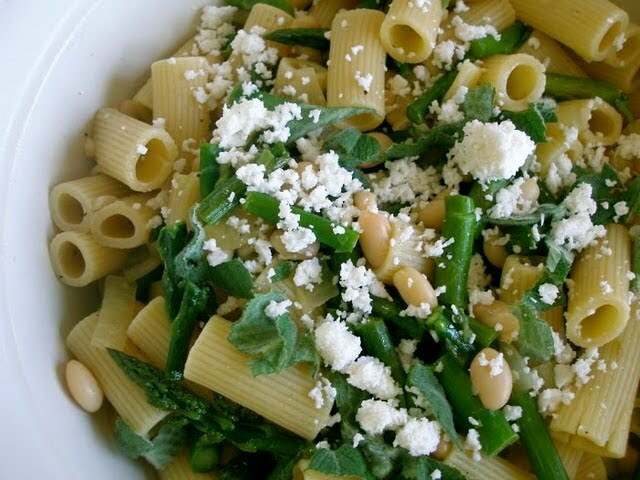 Since we grow about 90% of all the vegetables we eat all year long, what we eat is based directly upon what is in season or that which we have stored. I'm very much a seasonal cook and that is why our recipes are organized two ways on our blog- by category (baked goods, side dishes, etc.) and by ingredient (apples, green beans, zucchini, etc.). 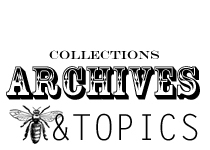 Both recipe indexes can be found across the top of our blog, just under the title. I love trying new recipes, so I'm often adding to our indexes. Finding new recipes that are true to the season or include food we have stored can be challenging and this is why I value our indexes so much- I use them a lot and I hope others find them useful as well. You've provided a nice sketch of your layout! You really have utilized your area well. 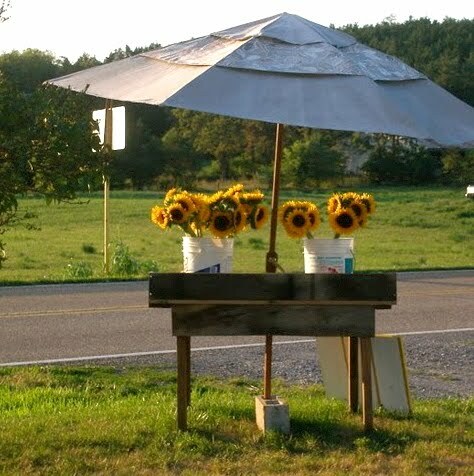 Perhaps it will inspire others with ideas for their own homestead! Thank you, friend! I've thoroughly enjoyed hearing more about your homestead! If you'd like to ask THHP a question, just leave a note in the comment section. And I want to encourage you to visit her blog at Thy Hand Hath Provided and get to know even more about this incredible woman who inspires so many! Yes, it can be done. Homesteading on only 1/10th of an acre. And in the city no less. With a house, chickens, and a garden. Perhaps you've already seen and heard what the Dervaes family is doing in Pasadena, California on their postage stamp of a yard, but I'm still amazed every time I watch one of the many video clips of this family and their homestead. It's a good reminder for those of us who sometimes think we need a "different" place to live so we can grow something. 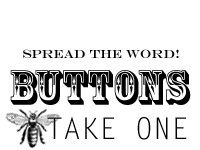 Check out this fact page to see exactly what they grow and produce by clicking HERE. If you'd like more information on what you can do on your own small, urban homestead, you might like to read Carleen Madigan's book, The Backyard Homestead (click the link or seem my "books" tab). 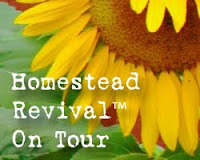 Tomorrow, I will be hosting the first of a once-a-month Homestead Tour so you can get an idea of what others are doing and how. I hope you'll be back because we're headed to one of my favorites homesteads! When you mill your own grains sometimes the recipe just don't come out the same. So whenever I find a whole wheat recipe that works, and works well, I'm really excited. Sue Becker of Bread Beckers has a cookbook of recipes she has compiled that is worth every penny of the $6 she charges for this little gem. Zucchini Bread is just one of many I make regularly as her recipes have become a part of our every day life. Beat oil and honey together, then add eggs and vanilla. 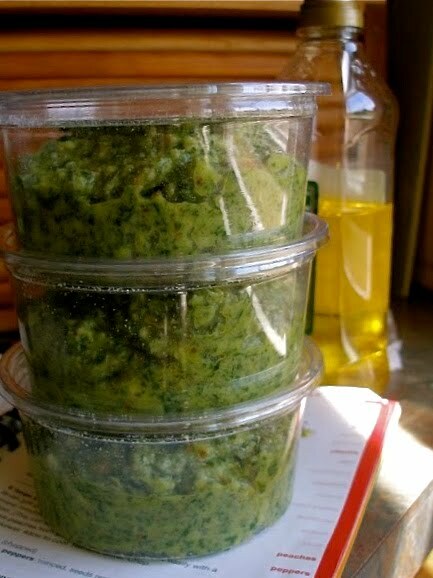 Stir in grated zucchini and/or carrots. Combine dry ingredients then add to liquid mixture. Stir in nuts and/or raisins. Pour into buttered 9" x 5" loaf pans or you may use muffin tins. Bake at 350 degrees for 45-50 minutes (12 - 15 min. for muffins) or until tester comes out clean. As you already know, zucchini bread is a great use of all that squash coming out of the garden. Make bunches of this and freeze it for breakfast later on. But of course, you'll want to eat some as you go.